The history of sound recording begins here. Édouard-Léon Scott de Martinville invented sound recording when he conceived of a machine that would do for the ear what the camera did for the eye. His "phonautograph" inscribed airborne sounds onto paper, over time, to be studied visually. He called his recordings "phonautograms". Collections of his work lay silent and forgotten in venerable French institutions for 150 years—their provenance indisputable and their chain of custody uninterrupted. Following leads offered by First Sounds researcher Patrick Feaster and tips gleaned on the trail, David Giovannoni located six collections containing several dozen sound recordings made in Paris between c.1853 and 1860. Neither Scott de Martinville nor his contemporaries conceived of playing back his recordings; however, First Sounds—Patrick Feaster in particular—has coaxed nearly 20 to speak and sing to date. Scott de Martinville first imagined an apparatus to gather and fix airborne sounds, patterned after the human ear, while editing Professor Longet’s Traité de Physiologie. 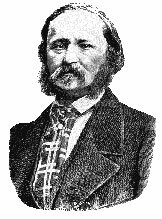 In 1853 or 1854 (he cites both years) he began work on “le problème de la parole s'écrivant elle-même” [“the problem of speech writing itself”]. By the end of 1857, with support from the Société d’encouragement pour l’industrie nationale, his phonautograph was recording sounds with sufficient precision to be adopted by the scientific community. As a laboratory instrument it contributed for decades to the nascent science of acoustics. His vision was as much aesthetic as scientific, and he was captivated by his invention's power to register the ephemeral onto paper: “Pourra-t-on conserver à la génération future quelques traits de la diction d’un de ces acteurs éminents, éminents, de ces grands artistes qui meurent sans laisser après eux la plus faible trace de leur génie?” [“Will one be able to preserve for the future generation some features of the diction of one of those eminent actors, those grand artists who die without leaving behind them the faintest trace of their genius?”] He imagined many uses for sound recordings. But what he didn’t imagine was a day when recorded voices might be heard again. 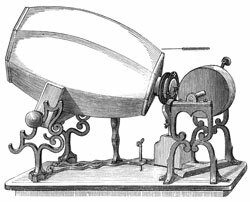 Nor did anyone else until, with notable synchronicity in mid-1877, Charles Cros sketched the idea of his paléophone in France and Thomas Edison began work on the phonograph in the United States. Scott de Martinville's meticulously documented experiments were logged upon receipt by three venerable French institutions and reported in contemporaneous publications. In addition, an album of phonautograms presented to Henri Victor Regnault has been in the possession of the Institute of France since its accession of Regnault’s papers upon his death in 1878. In 2008 First Sounds located and played back a Scott de Martinville recording made 17 years before Edison invented the phonograph. The editors of The New York Times considered this development (and sound) so significant that they broke the story ahead of its embargo on the paper’s front page. Within hours it was international headline news: in 1860 a forgotten inventor sent a voice into the future and researchers had just recovered it. Granted, inscribed in a haze of smoke it had not pierced the veil of time unscathed. Like all of his surviving recordings, it is crude by today’s standards of fidelity. Nonetheless it is aurally interpretable, and it retains the indisputable distinction of being among the earliest recoverable sound recordings. In recognition of the technological and cultural significance of Scott de Martinville's recordings, the Library of Congress inducted all of them into its National Recording Registry in 2011. UNESCO followed in 2015 with their inscription onto its Memory of the World Register. These are humanity’s first recordings of its own voice—each seminal and unique—the first vocalizations captured from the air by machine, inscribed onto a permanent medium, disembodied from their speakers, and sent into the future to be heard more than a century after their speaker's death. The ARSC Journal has published Patrick Feaster's definitive annotated Discography of Scott de Martinville Phonautograms. Feaster has also prepared The Phonautographic Manuscripts of Édouard-Léon Scott de Martinville in which he offers transcriptions of the texts in both the original French (annotated to show textual variants) and a strict French-to-English translation. David Giovannoni has assembled a facsimile of each Scott de Martinville dossier held in Parisian archives. These facsimiles offer immediate visual access to source materials. Derived from our high definition scans of handwritten documents or reprinted from long unavailable texts, the facsimiles trace the invention and development of airborne sound recording in Scott de Martinville's own words (with commentary by his contemporaries). They also contain an image of each phonautogram. Here Scott de Martinville gives his first account of the phonautograph and offers as documentation his very first experiments. Scott de Martinville's only drawings of his phonautographs survive in these patent documents. Scott de Martinville tells of his invention’s progress six months after Principes de Phonautographie. Scott de Martinville presented this album of phonautograms made in March and April 1860 to Professor Henri Victor Regnault from “his devoted and grateful servant and student”. Scott de Martinville presented these materials to the Académie des sciences de l’Institut de France to document his ongoing work in phonautography. This deposit and Regnault’s album contain his most technically-adept recordings. Near the end of his life, Scott de Martinville self-published an anthology that documented his work on the “problem of self-recording speech.” He led off with an essay conosidering the significance of his work in light of Edison’s newly-invented phonograph. This is his concerted and final effort to set the record straight for future generations. Facsimile in French, with English preface.